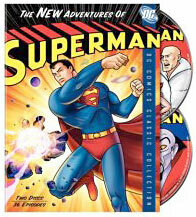 TV DVDs - - - - - - - -- Access the huge TV on DVD catalog! Warner Bros. has been releasing these amazing 5 disc 'Signature Collections' for some time and they are exemplary - the Film Noir collection is one of my all-time favorite DVDs, as are the Bette Davis and Joan Crawford box sets. They also offer collections I haven't seen devoted to Burt Lancaster, Errol Flynn, Alfred Hitchcock, Cary Grant, Judy Garland, Bogie and Bacall, Basil Rathbone, Robert Mitchum, John Wayne, Elizabeth Taylor - and they all look like winners, packed with definitive films from the silver screen's greatest legends. 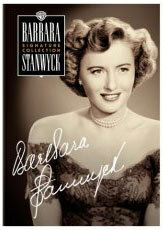 This Barbara Stanwyck Signature Collection is another DVD masterpiece. Not only are these all excellent motion pictures but the shorts that come with these discs are a joy to behold themselves, they come from the same year as the films to give you a true retro movie going experience. Boy, have times changed - these quaint live action shorts and stylized Tex Avery Warner Bros. cartoons will rocket you right back to long gone times. What a great idea to include these ultra-rare gems. 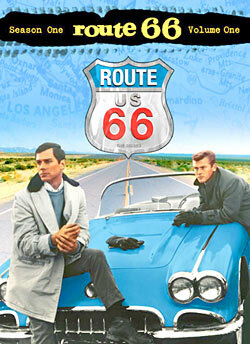 I like the vintage movie posters that comprise the DVD covers, a sweet touch. This is a nicely designed but not overly fancy package sure to offer some film classics you've never seen or not seen in a while. 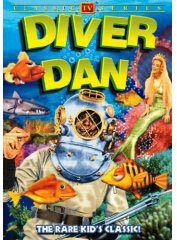 Most if not all of these black & white films are new to DVD, new to home video even. The most famous and most anticipated film in this series, Executive Street is a luscious tale of corporate greed in the early-fifties, when such a thing was barely heard of. It's an all-star affair with William Holden, Walter Pidgeon, Fredric March, Shelly Winters and June Allyson, one of those stylish, big budget motion pictures the early-fifties was known for. This disc includes an amazing audio commentary by Oliver Stone who explains not just the cinematic attributes of this unusual film but its cultural meaning as well. Stanwyck is fabulous as the hick sharp shooter who became one of the nation's first female superstars in this frothy film of the mid-1930s. Fans of old time radio will enjoy the dramatic adaptations of this well-directed melodrama that are included here. Look for the future Nancy (Davis) Reagan with Barbara Stanwyck as the wronged woman in this stylish mystery. The final disc offers a 'Double Feature' consisting of To Please a Lady (1950), a romance drama with Clark Gable that's set against the Indianapolis 500, and Jeopardy (1953) a dark thriller directed by the great John Sturges. 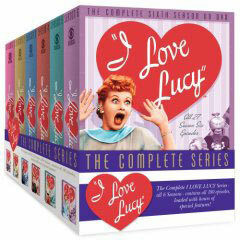 All in all a super collection of unforgettable MGM motion pictures starring one of Hollywood's greatest actresses.